N, 82° 6.072′ W. Marker is in Athens, Ohio, in Athens County. Marker is at the intersection of Court Street and Washington Street, on the left when traveling north on Court Street. Touch for map. 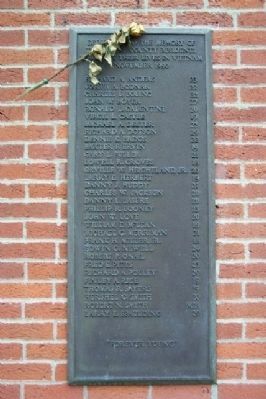 Marker is on the wall of the Athens County Courthouse, near the northeast corner of the building. 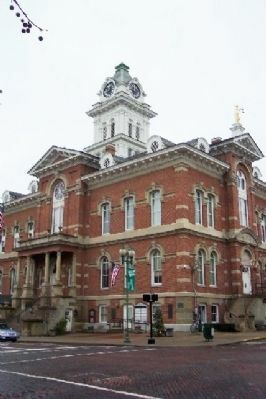 Marker is in this post office area: Athens OH 45701, United States of America. Touch for directions. Other nearby markers. At least 8 other markers are within walking distance of this marker. First Settlers in Athens County (here, next to this marker); Athens County Revolutionary Soldiers Memorial (a few steps from this marker); Athens First Settlement - 1797 (within shouting distance of this marker); “The Berry” (about 300 feet away, measured in a direct line); Ohio University (about 600 feet away); Ohio University 1915 Alumni Gateway (about 600 feet away); Athens County Civil War Soldiers and Sailors Memorial (about 700 feet away); Student Voices (about 700 feet away). Touch for a list and map of all markers in Athens. More. Search the internet for Athens County Vietnam War Memorial. Credits. This page was last revised on June 16, 2016. This page originally submitted on January 22, 2009, by William Fischer, Jr. of Scranton, Pennsylvania. This page has been viewed 1,854 times since then and 8 times this year. Photos: 1, 2. submitted on January 22, 2009, by William Fischer, Jr. of Scranton, Pennsylvania. • Kevin W. was the editor who published this page.